Since its start in 1992, Interior Concepts has created a long line of loyal customers. Interior Concepts has the unique ability to build its furniture in one-inch increments. This helps their customers maximize space. They can also change standard designs easily based on customer requests. Companies and schools work with Interior Concepts to create engaging and functional furniture. 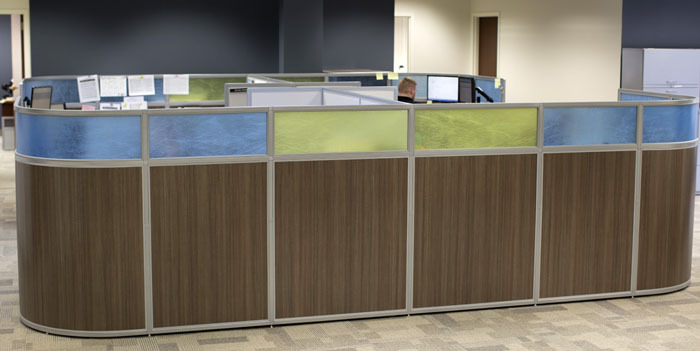 When Interior Concepts decided to update the main floor of its corporate headquarters in Spring Lake, MI, the company decided to represent what they are all about. They incorporated sit-to-stand functionality in workstations and office desks. The comfortable workstations encourage employees to move more throughout the day. And since collaboration is important the company designed several spaces for small group meetings. They also used a contemporary color scheme that incorporated the company’s logo colors. In the future the company plans to incorporate art work and soft seating to give the space a homey feel. They also plan to update the second floor work area. If you’re moving or expanding, Interior Concepts can help. Take a look at our commercial office furniture products to start creating your ideal and productive office design space.